As Euro fashion for kids becomes more and more prevalent in the U.S., you might find yourself wondering just what Euro fashion entails. While there are many facets to the popular clothing and accessories in Europe, some basic principles for girls are to wear layers in different lengths. Boots are also very popular. For boys, Euro fashions are often more colorful than what is sold in the U.S.
What children wear in Europe is loosely based on what adults are wearing. In general, European fashions are trending back towards the 80s in terms of certain clothing elements, but in terms of hair and makeup, the 80s are long forgotten. In terms of particular styles, the following fashions are big in Europe. 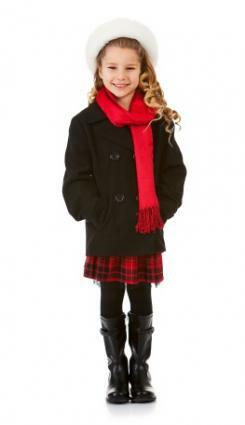 Jumpers: For young girls, jumper dresses are hot items. Pair the jumper with thick cotton tights and a plain shirt for babies and toddlers, or wear one with jeans for older girls. Skirts: Extremely popular in Europe, girls wear skirts with tights, leggings and even jeans or other pants. This goes along with the layering look, and creates a sophisticated look in comparison with sweatpants and sneakers. Asymmetrical tops: While younger girls won't generally wear over-the-shoulder tops, you may very well find odd-shaped necklines, asymmetrical sleeves and uneven cuts around the waist. Pants & Leggings: Skinny jeans are hot, even for little girls. In the past, boots were generally worn with skirts, but the skinny jeans fashion means that boots are still worn with many pairs of pants (legs tucked into the boots). Boots: Virtually all children in Europe wear boots, and girls keep wearing them long after boys have switched over to sneakers. Boots can be of colored suede or brown leather, but most often have a flat sole, and usually are mid-calf in length. While European women wear knee boots, the children's versions are generally higher than ankle boots, but lower than knee boots. Children's boots are often colored, but can be black or brown as well. Color: Think that purple sweater is for girls, but you do a double take because its cut and sizing are for boys? You may often find that sure enough, the tag reflects boys' sizing. European men are less afraid of color than you might expect, and this is reflected in children's clothing as well. If you take a baby to Europe, you may be surprised how often you get asked the question 'boy or girl?' even though your baby girl is clad almost exclusively in pink. Of course, clothing stores do have separate boys' and girls' sections, but you might find some surprising colors in the boys' section. Accessories: Mmany European boys wear scarves, even when the weather may not technically require one for warmth. European men are generally more polished in their wardrobe, and this includes accessories, such as scarves, designer shoes, bags, wallets and shoes. H&M Kids: H&M, short for Hennes & Mauritz, is a very popular clothing chain in Europe. Offering men's, women's and children's clothing in fashionable styles at affordable prices, H&M can be found in many European cities, as well as in some states in the U.S. While not every H&M store has a children's clothing section, you can filter out the ones that do carry kids' clothing using their store locator online before you head out to the local H&M. The style at H&M reflects the hottest styles in Europe. Petit Bateau: While on the pricey side, Petit Bateau has a long history of high fashion and quality construction in clothing. The styles are classic ones, both in Europe and in the U.S.
Du Pareil au Même: Abbreviated as DPAM, this French shop offers a wide range of girls' Euro-style clothing and shoes. The styles are currently popular in Europe, and the prices are affordable, although shipping is actually from Europe, which considerably raises the cost of an order. For authentic European clothes and shoes, this shop can't be beat. These stores are great resources if you are shopping for items that will fit into the Euro fashion for kids trend. However, with the information provided here, you can also visit local department stores, not to mention Wal-Mart and K-Mart to find some of these essential items without going overboard on the clothing budget.